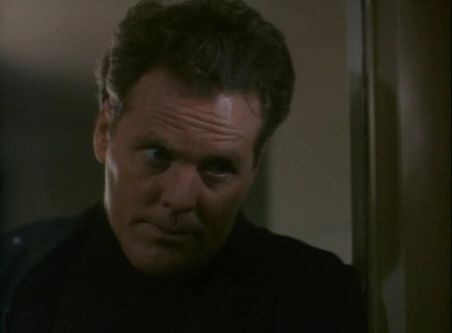 The look Wings Hauser gives just before he dumps a jug of milk on your head. Wings Hauser of Vice Squad fame directed this sleaze-thriller for PM Entertainment – though it largely avoids the bullets-n-explosions you may be expecting from their usual output. Like Vice Squad, this is a thoroughly sleazy and seedy tale of murder in Los Angeles – where young, naive actors (mostly women) with Hollywood aspirations are being used as props in snuff films – unbeknownst to them until it is too late. And by snuff films, I mean remakes of famous death scenes, from Psycho‘s shower scene to Scarface‘s chainsaw death that the two villains apparently will be editing together into a film called, you guessed it, The Art of Dying. Wings is suitably unhinged as usual, and a skeezy undercurrent of leftover 80s-homophobia and misogyny runs through the film – as Wings has at least one tirade throughout (“Maybe I’ll just go gay!” he claims, during an argument wherein he posits that men have had hard times dealing “with women” in the 70s, 80s, and now 90s) and the two male villains are nothing but a stereotypically sketched “crazed” couple in love. Of course, by the end of the film Wings has murdered both of them violently, and won back his girlfriend. There’s analytic essay in here just begging to be written about Hauser’s character fighting against the external homosexuality around him to retain his own heterosexual masculinity, but I digress. Plus, I haven’t even mentioned the love scene where Wings shoves what looks like strawberry jelly in his partner’s mouth, before dumping a whole jug of milk on her head. Yeah. As bizarre and entertaining as it all is, the film drags through the end, and its 97 minute running time ends up feeling about double. A shame, because otherwise it’s a fascinating piece of absolute trash with a stacked cast of character actors that will have you questioning Wings’ sanity and directorial choices the whole while. It’s something, alright. The Holy Gasp Release New Single "That's How I Get Down"